The preorder for The Book of Biff #1 has begun! I’m working on the cover and some new bonus comics right now. I should have all the extras ready in the next few weeks. Now all I need is to get enough preorders to afford the deposit at the printer 🙂 Click here for more information. 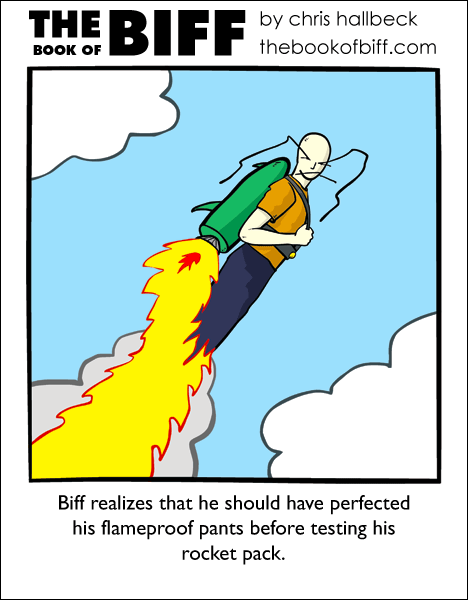 This was always a problem I considered when I thought about jet packs and such… you really would need very flame-resistant pants! And a shirt if it hangs down too far. 😛 None the less, wish I had a jet pack! Human’s have a natural wetting system to use in case of fire. That’s why one needs to remain hydrated. Biff *is* human, isn’t he? I’m surprised that his eyebrows weren’t scorched in the process. Don’t worry, his legs will eventually grow back. Just like his head does, or his whole upper half when he gives himself a bad papercut; compared to that this is a mere nothing, just a scratch. 🙂 Go Biff. But given that my pants don’t catch fire I would like to try this too. When Biff gets chopped in half, and his lower half grows back, does his upper half also grow back and the other section, all this time have we been observing the adventures of multiple Biffs? all the products of a mitosis like form of reproduction? How dark the con of man. I just read your latest clickwheel download. It was great. You are so gifted. Landing’s gonna hurt like meow, man. I really like the expression on this one. A non-heat producing jet pack would be better, either in the form of a giant fan, or some sort of energy impulse. Hee. I agree with the Scarf; he doesn’t look so much freaked out as disappointed that his jeans are on fire. He looks like hes thinking “hm. My pants are on fire. Shame”. Nowadays Jetpacks are strapped to the ankles instead and Science moves on. You know what they say about guys whose pants are on fire. . .